After his commencement address went viral, Austin Kleon was encouraged to write about his ideas on creativity. 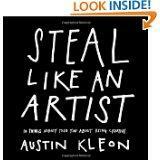 In Steal Like an Artist, Kleon gives tips for beginning artists trying to create original work. Mark Perzel talks with Kleon about his new book and about what it means to steal like an artist.